CryptoDozer’s best players of the week! Are you one of this weeks’ top ETH earners? The last seven days saw some incredibly proficient players having real success. One player managed to collect 10ETH with a single doll and six players collected two ETH each in a single day. 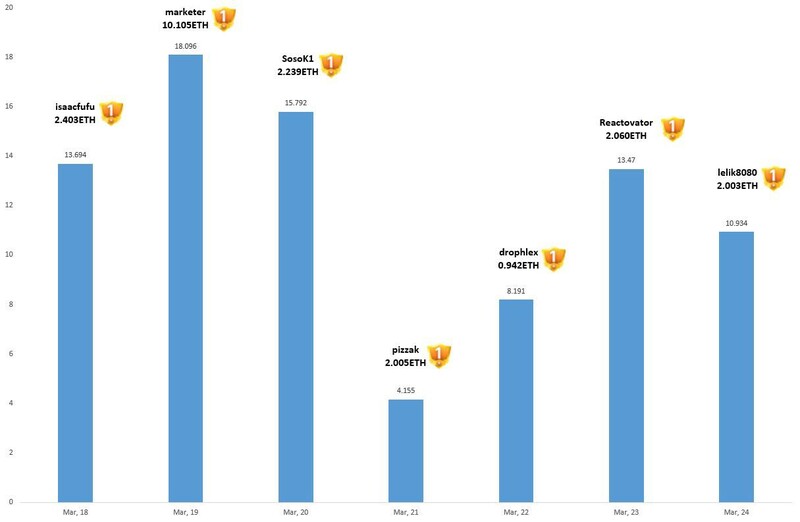 In fact, in just this week alone, CryptoDozer Players managed to collect over 84ETH! That’s a lot of successful and skillful players, and we couldn’t be happier! However, the ultimate 70ETH CryptoDoll is still out there waiting to be won by one adept player, will you do it this week? 12 ETH earned by six players! While those two players were fantastic we don't want to celebrate just them, we want to shine a light on the best players from the entire week! So it’s time for their moment in the sun and to show off just how much they managed to earn. Can you join this exclusive group next week? CryptoDozer lets you earn real ETH by collecting cute CryptoDolls, it's a super simple game that has some serious ETH. Our CryptoDolls have a range of values and rankings, including Fancy, Bronze, Silver & Gold! With ETH value reflected accordingly. Our Silver CryptoDolls are worth up to one ETH while our Gold CryptoDolls can be worth two, seven, 10 and even 30ETH. Then there’s the ultimate prize, a special 70ETH CryptoDoll! This will be won by a single lucky player making them the ultimate Crypto Rich. Will it be you that collects this ultimate prize? We have been hard at work making improvements and we are delighted to confirm that ETH payment is now a lot faster. We’ve reduced the current 3 day check period down to just 24h. Meaning that everyone should get their ETH faster! Additionally, with regard to the current issue surrounding Ethereum gas ratio, we are doing our best to improve the service to allow for smoother gameplay for our customers.